This is by far the best apple dessert I’ve ever tasted! The topping tastes just like an oatmeal cookie. It’s the perfect combination of crunchy, chewy cookie and buttery soft apples. Great dessert for a party or family gathering (double the recipe in a 9×13-inch baking dish) or to make just for yourself on a chilly evening. Simply delicious. 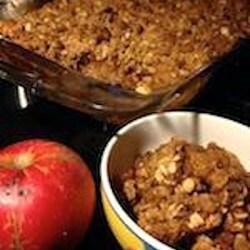 Delicious Apple Crisp Something Special Apple Crisp Sister Schubert’s® Caramel Apple Crisp Crispiest Apple Crisp Apple-Raspberry Crisp Apple and Dried Cranberry Crisp Apple Crisp with Cranberry Compote Apple Rhubarb Crisp Apple Oatmeal Crisp Oatmeal Apple Crisp To Die For!